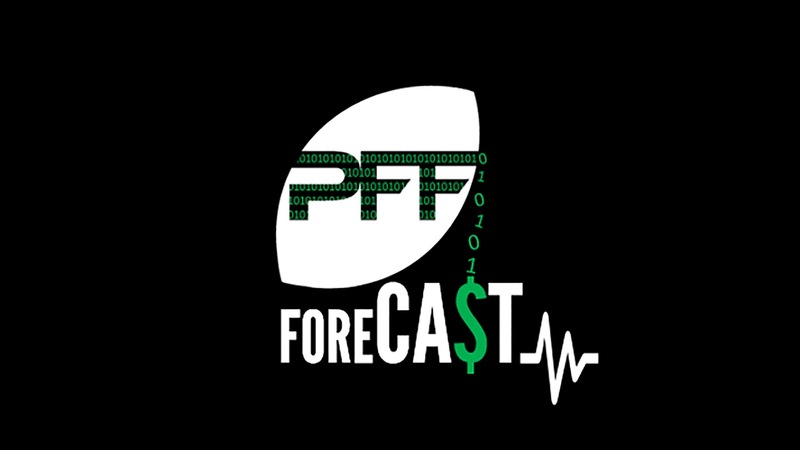 As the NFL regular season is a mere two months away, we at the PFF Forecast have been previewing 2018 outlooks for each of the NFL’s divisions as a part of our weekly podcast, after spending the majority of the offseason reviewing the 2017 season from the analytical perspective at the team level. One of the more compelling divisions we’ve reviewed thus far has been the NFC North. 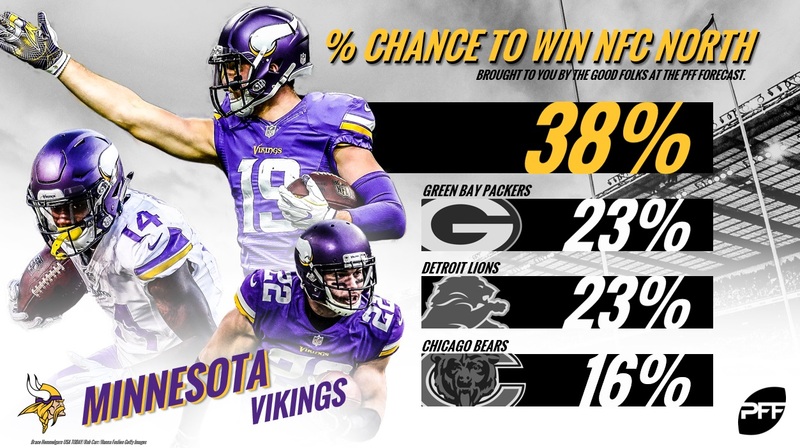 Won by the Green Bay Packers each season from 2011 to 2014, the Minnesota Vikings have popped up and taken the North in two of the last three seasons, taking advantage of a down season by Packers’ star quarterback Aaron Rodgers in 2015 and an injury to the signal-caller in 2017. The Detroit Lions have been a viable team the last four years, winning 36-of-64 regular-season games, while the Chicago Bears are looking to replicate the new coach and young quarterback approach that has yielded results for teams like the Philadelphia Eagles and the Los Angeles Rams in recent seasons. Our projections make use of our PFFELO rating system, which is an iterative, backward-looking algorithm that leverages PFF grades to yield a schedule-adjusted power ranking that can predict roughly three-fourths of the variance in the Vegas spread on a weekly basis. However, while we regress these numbers towards the mean in the event of a coaching or quarterback change, we have very few instances of teams going from a quarterback like Brett Hundley to one like Rodgers one season to the next, meaning we also need to incorporate features like opponent-adjusted quarterback grades (among others) in our simulation as well. Even then, our projection for the Packers is certainly a product of how far the Packers fell in 2017 (finishing the regular season 20th in PFFELO), and a relatively modest projection for their regression back towards where they were before Rodgers left. There’s also a projection of regression for the Vikings as well, as they break in a new quarterback and the league’s eighth-most-difficult schedule in our rating system. Below are our full projections, as well as some other interesting discussion points for the Black and Blue Division. Odds are in parentheses and are sourced from BetOnline. The Vikings remain the class of the division, but are projected under their 10.5 Vegas win total going into the season. As stated above, Green Bay is projected to improve from 2017, but due to the relatively-unique situation of getting back a generational player at the quarterback position, are well underneath their Vegas win total. Be that as it may, their probability of winning the Super Bowl given that they make the playoffs is 6.1 percent, which is closer to the Vikings number in that situation (7.2 percent) than in the general simulation, showing the effects of an elite quarterback when the air is rarefied. Among optimistic plays on win totals, the Bears OVER 6.5 wins (even at -130) offers the best value, especially given the aforementioned environment surrounding second-year quarterback Mitchell Trubisky. The Lions, however, are still the favorite to finish third in the division, earning more wins than the Bears in more than 50 percent of our simulations. Aaron Rodgers’ value cannot go understated. He’s been worth over 6.0 wins above replacement in three of the last six seasons, which equates to being 12.0 wins above a Brett Hundley coached by a Mike McCarthy team. Looking ahead to next season, there is no one who would logically challenge Rodgers’ atop the NFC North totem pole, especially with Case Keenum now in Denver and Kirk Cousins a Cluster 4 quarterback. Perhaps the greatest non-playoff moment from last season belonged to Mr. Rodgers when he put Jason Garrett back into his crib with a last minute drive in Big D that could have qualified as “make believe” (in an ode to the original Mr. Rogers). While that Lock of the Week seemed tenuous for most of the game, Rodgers late-game heroics were not an anomaly. Since 2006, there are 38 quarterbacks with 250-plus dropbacks in the fourth quarter of a one-score game, Rodgers has a passer rating of 100.8 (second only to Russell Wilson). The Antonio Brown of the NFC has proven to be a dominant force when on the field. This season, he will look to keep up his league-best contested catch rate in an attempt to break in his team’s new quarterback. Should Diggs not manage to deliver as he has in the past, a couple players ready to take the mantle as most valuable non-QB are Davante Adams and Allen Robinson, who figure to benefit from having a receiver-friendly situation in which to operate. Smith has been the prototype of a do-everything safety, playing more than 180 snaps in each of our linebacker, cornerback, strong and free safety designations a season ago. While coverage stats for safeties can sometimes mislead, he was the primary coverage player on 47 pass attempts in 2017, intercepting five of them and breaking up an additional five. His 28 total stops and 10 total pressures also ranked in the top 10 at his position group in 2017, helping the Vikings finish with the league’s best defense in our rating system. Cousins’ performance last season in the wake of Washington’s deteriorating supporting cast did not come at the right time for the new Vikings quarterback. In each of the two seasons prior to 2017, Cousins was a Cluster 2 quarterback, only to plummet into the fourth cluster with a supporting cast that fell into the bottom tier of our supporting cast metrics. While he is certainly not Aaron Rodgers, if the Vikings can repeat their generationally-impressive performance in support of their quarterback from 2017, then Cousins should be a good bet to return Keenum-like numbers as a Cluster 2 quarterback. If that doesn’t happen, you could easily see him churning out a division-worst quarterback performance.